MORE than seven million pounds is being invested every year – over the next four starting in 2018 – in producing the next pipeline of Asian talent across the arts in England. The money is also going towards developing and enhancing many different festivals and initiatives that sometimes began as relatively small community affairs. Many of these organisations, which have been designated National Portfolio Organisations by Arts Council England, have welcomed the cash, and said it will allow them to grow and develop and fulfil a wider vision of artistic practice in England. An Arts Council England (ACE) National Portfolio Organisation (NPO) is a group that receives funding for four years between 2018-2022. A similar system has been in place since 2015 but grants existed for only three years, not four. Now the ACE NPO includes grants for museums and libraries as well. In this article, however we are only looking at Asian led or themed theatre groups and other artistic organisations with a distinct Asian output. As in any system of allocating government funds – there are winners and losers and the broad sweep of organisations have maintained their 2015-17 funding arrangement, which in real terms means a slight fall in funding over the next four years. Jatinder Verma, artistic director of Tara Arts, one of the oldest and best-known theatre companies, said he welcomed new organisations being added to the list of those already receiving support, but was disappointed that some like his own (and many others) had not been able to secure increased funding. Tara has been earmarked to receive just over £200,000 a year for the period, 2018-22. Verma told www.asianculturevulture.com: “Having successfully completed the creation of Britain’s first multicultural theatre building (which has already won several awards), the company received no uplift in its NPO grant. He told acv that Tara received a 50 per cent cut in ACE funding from 2008 and in that period had collaborated in a production with the National Theatre, developed a touring strand known as Black Theatre Live and had continued to cement the organisation’s ability to be a national conduit for emerging writing and acting talent. He highlighted that a recent government report earlier this year had identified a drop in Asian audiences accessing the arts and that Tara was helping to buck a worrying trend. “We experience an average 34 per cent BAME (Black, Asian, Minority, Ethnic) audiences against the national and London averages of eight per cent and 13 per cent respectively. In all 831 organisations are set to receive a total of over £1.6bn over the next four years and covering some 844 projects and groups. For the first time, £170 million more is being invested outside the capital. More than 180 organisations and groups are being funded for the first time. Among these is Common Wealth – perhaps best known for its ‘No guts, No heart, no glory,’ production about young Muslim girl boxers. Conceived in Bradford, the group does not have a theatre of its own and its productions go on the road and are far more about the ‘experience’ than conventional drama and storytelling. They often use unusual locations – their latest work takes place in a disused factory near Port Talbot steelworks in Wales and their work has a distinct political edge. It will get £145,000 a year for the first time and members tweeted their delight on the day of the awards being made public. Sir Nicholas Serota, ACE chair and Darren Henley, ACE chief executive made an announcement of the awards at a live event at The Curve in Leicester on June 27. Birmingham-born dance artist Aakash Odedra spoke at the event. His dance outfit, Aakash Odedra is based at The Curve. He spoke for a few minutes at the ACE NPO launch and made an emotional case for the arts and its wider contribution to society. He said the £365,000 ACE NPO grant (as Leicester Dance Theatre Ltd) would allow him to create a company, rather than just be a one-man outfit and he told the audience that he would light the flames of passion and provide the sand and stone required to build bridges across which a new generation would cross. Among the organisations receiving the largest amounts are New Art Exchange (NAE) in Nottingham. It has been earmarked to receive £852,898 for 2018-22. Set up only in 2003, it is primarily focused on the visual arts and grew out of APNA Arts and EMACA Visual Arts. The former was instrumental in creating Nottingham Mela, which continues to be managed by NAE. The Mela will run from September 8-10 this year. The first part will be hosted at NAE’s building which involved the complete refurbishment of an old theatre. In 2009, NAE won five architectural awards for the transformation. The premises contain gallery space as well as theatre that hosts not just plays, but also music events. Davinder Virdi, gallery deputy chief executive told the Nottingham Post that the money would be used across the wide spectrum of NAE’s work. He added that that meant more local engagement, developing new talent, a stronger digital presence and more commercial activity to increase revenue and long-term sustainability. Just behind NAE in terms of funds allocated for 2018-22, is the Tricycle Theatre. It is set to receive £829,519 a year. It has a long history of backing diversity through its productions and currently under the leadership of Indhu Rubasingham, its artistic director, it is all set for a multi-million-pound plus refurbishment. A spokeswoman for the theatre said it would re-open fully in its new guise in Spring 2018 and would comment then about the ACE NPO funding. The theatre remains open and is being redeveloped in stages. The Akram Khan Dance company is the third highest recipient, as a distinctly Asian-led organisation – and will be granted £500,610. Led by the world renowned Kathak dancer Akram Khan, the artist is highly regarded not just for his work as a dancer but as choreographer and imaginative collaborator. His award-winning production of ‘Giselle’ for the English National Ballet brought Tim Yip, Oscar costume-award winning designer (‘Crouching Tiger, Hidden Dragon’) onto the project. Khan makes a debut at the Darbar Festival this year. A celebration of Indian classical music usually in September, it extends to a couple of dates at Sadler’s Wells in November. No one from the company has commented publicly. It routinely performs abroad. Arts Asia Ltd does work mainly on the South Coast and is best known in the region for organising the Southampton Mela which took place earlier this month (July 15). Working across artistic mediums and involved in education, training and workshops, it revealed Vinod Desai, its founder and chief executive is leaving after 36 years. Receiving almost £96,000 a year for the next four years from 2018, Desai said it seemed the appropriate time to step down and let someone else fulfil the vision 2018-22. Jaswinder Singh director of Asian Arts Agency, based in Bristol, welcomed the almost £281,000 it is set to receive. A mixed artistic spectrum organisation, it was behind the recent Punjabatronix tour, which saw musicians from Punjab work with UK based DJ Swami and visual artist John Minton take their music on the road to a handful of other venues across the country. 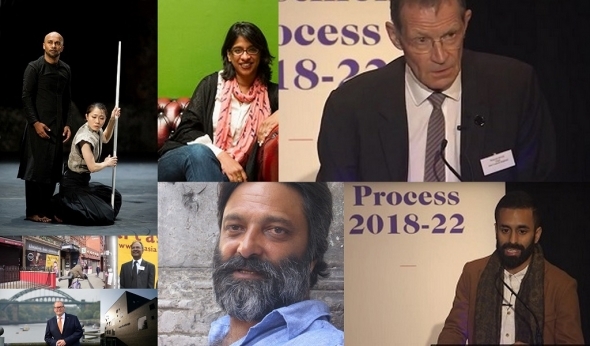 Singh commented: “We look forward to continuously delivering our ambitious work, promoting South Asian arts and music in Bristol, nationally and internationally. Freedom Studios based in Bradford is set to receive almost £141,000 a year. A community theatre company that grew out of the Asian Theatre School and a partnership with Red Ladder Theatre Company and the Theatre in the Mill, its early life was hugely shaped by Madani Younis, who is now based at The Bush Theatre in London. Freedom Studios was formed in 2008, it has continued to gather strength and sees itself as a nurturer of new talent. On its website, it said its co-artistic directors Aisha Khan and Alex Chisholm were “thrilled” by the allocation and would be striving to bring more young people into the theatre. The Bush itself (as The Alternative Theatre Company) is set to receive £585,000 – an increase of 20 per cent on its previous allocation. Its executive director Jon Gilchrist told its blog website that the increased funding would allow it to reach further into the community, have a more representative workforce and continue to search out the best new plays. Over at Gem Arts in Gateshead, near Newcastle, where it just completed its second Masala Festival, there was much to be happy about, reflected director Vikas Kumar MBE. It is set to receive £120,000 every year. “The coming four years will see the organisation continue to deliver an ambitious programme, supporting and championing the creative case for diversity at every level, offering something truly unique for artists, participants and audiences across the region,’ he said on the group’s website. Kali Theatre, another long-established theatre group expressed it delight on its Facebook page. It thanked everyone for their support and acknowledged its writers and collaborators and all its supporters. Its ACE NPO award is £196,500. Other groups with a South Asian heritage and practice receiving grants are Balbir Singh Dance Company (£150K); Bharatiya Vidya Bhavan (£129,000); Bradford Literature Festival (£300k); Darbar Arts Culture Heritage Trust (£245K); Kala Sangam £100K; Leicester Dance Theatre (Aakash Odedra Dance (£365k); Nutkhut (£100k); Punch Records (£251K); Peshkar (£75K) Rifco Arts (£325K); Sonia Sabri Company (£125K); South Asian Arts-UK (£181K); Shobana Jeyasingh Dance Company (£258K); Tamasha Theatre Company (£314K). A note about the methodology – the organisations identified here either have an explicit engagement with Asian communities, are led by an artistic director of Asian heritage and/or also have a history of producing diverse artistic productions and are engaged in diversity across the board with a strong South Asian flavour (- though for the purposes of this article) and our usual story remit, we have only looked at overwhelming and strongly discernible Asian involvement – and not examined distinctly black or other minority groups or organisations also designated as ACE NPO.